Couldn't there be a standard comment that is added to new users's questions automatically? Many of us have seen how most of the new users of this forum format their question. Not making use of LaTeX, just asking questions as something written in a homework textbook. I was one of them, when I wrote my first question. So why do we not add a standard, automated comment that is managed by (just a suggestion) https://meta.stackexchange.com/users/-1/community? Or make the comment part of the code included in questions? One problem would, of course, be that not all new users ask questions and format them in a way not approved by MSE. But would that really be a problem? I do not add a proposal as I do not know how my suggestion will be received. If it gets a positive response, I will include a suggestion in a edit, or if you folks have one. Wouldn't this suggestion be time-saving? Just a idea from my side, I do not know what you think. What do you think about the idea? As you don't want to make a suggestion out of this, I will say it is a good question without being a good idea. First consider the cost of such automated Comments. In the case of the previous user's personal efforts, the targeting required tweaking from time to time. In response to suggestions the automated Comments were removed after a designed time interval. Although we might learn something from the previous effort, there will be ongoing effort to maintain properly working code. 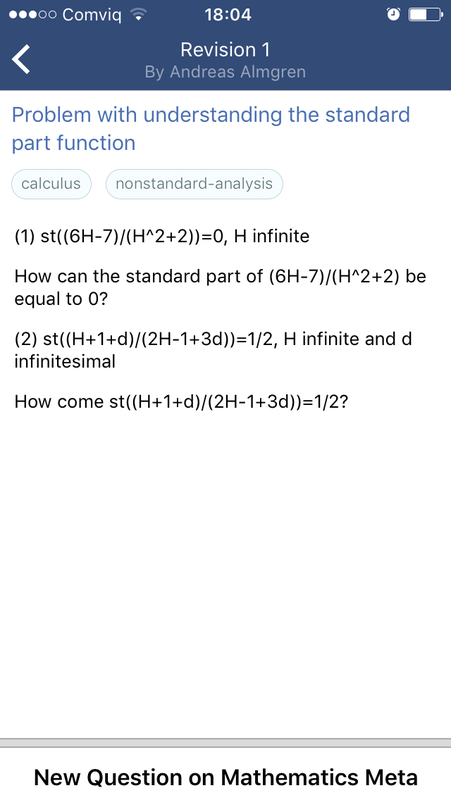 Second consider that currently the MathJax advice is already frequently posted by human beings, who can exercise judgement about whether to link to the introductory FAQ page, link to the Basic Tutorial and Quick Reference, and/or illustrate the idea by editing the Original Post for math formulas. Instituting an automated Comment would be a poor substitute for these personal interventions and might serve mainly to discourage them. Finally consider the information theoretic value of automated Comments in general. The information content varies in proportion to the negative log-likelihood of an event. In the limit if a certain Comment were always posted, it's probability of one would translate to information content of zero. In short this will be moderately expensive to implement with little benefit to the site even under optimistic assumptions. Not the answer you're looking for? Browse other questions tagged discussion feature-request comment new-users .